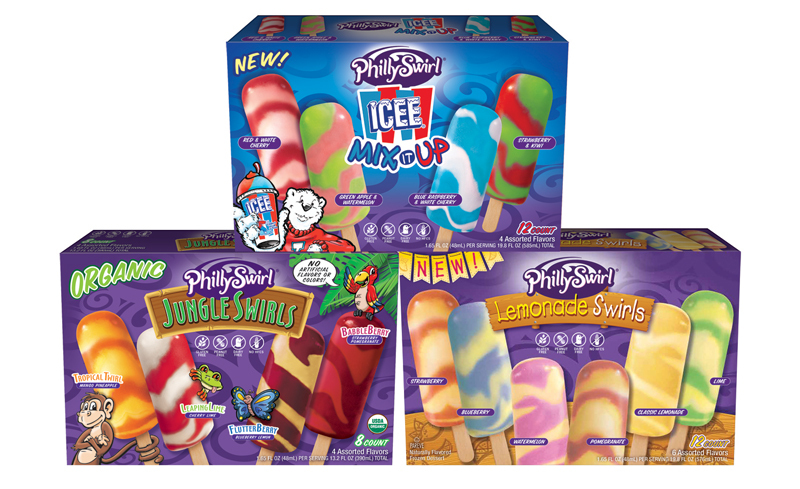 With lively tastes and eye-popping packaging, PhillySwirl frozen novelties are refreshing, enjoyable, and fun to consume. These sweet treats are colorful, classic Italian ices swirled into a variety of products. PhillySwirl frozen novelties were a big hit at my house and I plan on purchasing more soon. I think they'd be great to serve at summer parties, birthdays, and other events. They appeal to a variety of people because they taste delicious, are colorful, and are free of the top eight allergens. They are dairy free, gluten free, and contain no high fructose corn syrup. They're frozen deliciousness that most anyone can consume. 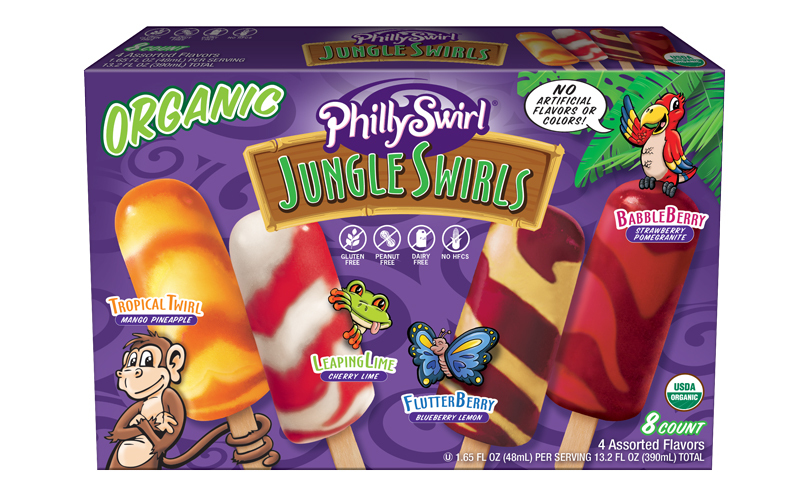 Organic Jungle Swirls - It's their first no artificial flavor and color product, flavored with real fruit juice and puree. Flavors include Tropical Swirl, Leaping Lime, Flutter Berry, and Babble Berry. ICEE MixItUp! - With the pop and fizz of your favorite ICEE beverage, you'll find swirled concoctions like red and white cherry, green apple and watermelon, blue raspberry and white cherry, and strawberry and kiwi. Lemonade Swirls - These open with the classic, refreshing taste of lemonade, followed by a blast of fruit flavor. Experience flavors like watermelon lemonade, pomegranate lemonade, and blueberry lemonade along with classic flavors like lemon lime, fresh lemonade, and strawberry lemonade. What I really liked about the PhillySwirl Frozen Novelties is that there's different assorted flavors in each box. Rather than having just one flavor to choose from, there were several. And the flavor combinations were somewhat out of the ordinary from what you'd normally find. Each frozen novelty treat is individually wrapped. All three new varieties went over quite well with everyone in my home. The new PhillySwirl flavor lineup is now on shelves, and can be found for an average retail of $2.99. To find where PhillySwirl products are sold near you, visit the product locator page at www.phillyswirl.com/store-finder. One person will win two free product coupons for PhillySwirl frozen novelties. I would enjoy trying first the ICEE MixItUp flavor. I would like to try the ICEE mix it up. I'd like to try the Lemonade Swirls. I would like to try Organic Jungle Swirls. I would like to try the lemonade swirls. I would love to try the Organic Jungle Swirls. I'd like to try the ICEEE mix it ups. Look so good! Thanks for the giveaway. I'd like to try: Organic Jungle. I love orange! I'd love to try the lemonade swirls! First we'd try the Lemonade Swirls. They all sound very good, but I would try the Organic Jungle first. We actually bought the Organic Jungle ones about 2 weeks ago and they were out of the ICEE flavored ones so I know my daughter really wants to try the Icee ones. I'd try the Jungle Swirls. I would start with the Tropical Swirl, but they all sound pretty refreshing for summer. I want to try the Lemonade Swirls. i would love to try lemonade swirls! I want to try the Organic Jungle Swirls first. I would love to try the Lemonade Swirls version from PhillySwirls. I want to try Organic Jungle Swirls first. The organic jungle swirl sounds tasty. I'd like to try the ICEE MixItUp! I'd like to try the Organic Jungle Swirls. I want to try the Organic Jungle Swirls most of all! I'd love to try the Organic Jungle Swirls (especially the Leapin' Lime! )...but the ICEE variety looks yummy too! I want to try the Lemonade Swirls. These sound delicious. I think my family would most like the lemonade swirls. Organic Jungle Swirls looks the yummiest to me! I want to try the ICEE MixItUp! I would be interested in trying out the ICEE MixItUp first and foremost. I think the Tropical Twirl – Mango Pineapple sound good. I would like to try the ICEE MixItUp ones first. I am sure any flavor would be refreshing on a hot summer's day. I would try the Lemonade first and then the Icee flavors. I would love to try the lemonade swirls! I want to try the Icee mix up. I would like to try the Organic Jungle Swirls. I really want to try the ICEE Mix it Up…had no idea that they existed. I tried the Jungle Blends already, and they were gone in 2 days. I want to try the ICEE Mix it ups 1st. I would love to try all the flavors but since I love Icees the Icee mix it up would be the first I would try. I would like to try the Lemonade Swirls variety first!